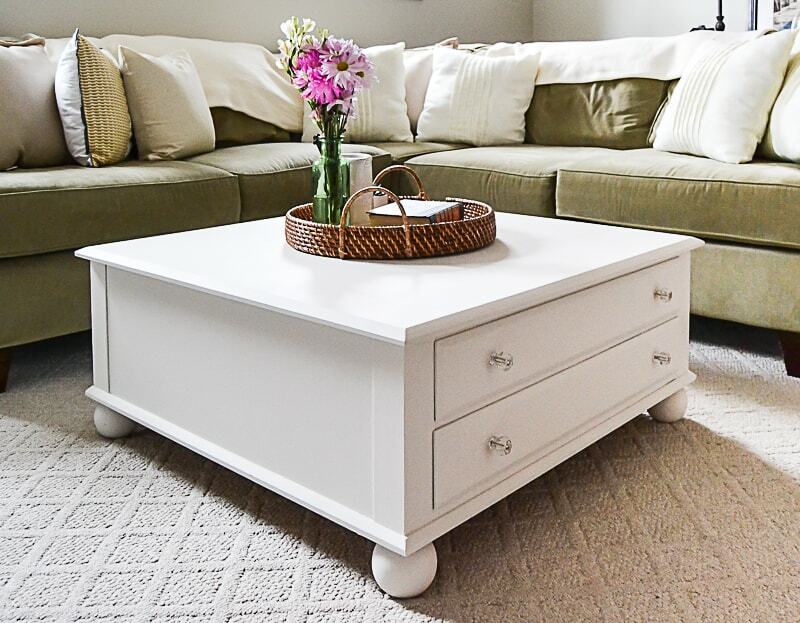 I want to thank Dixie Belle Paint for partnering with me on this Large Square Coffee Table Makeover post. All opinions are my own. The family room makeover is coming right along! We are in a rush to get it done before we close on our next flip house project in early March. Our family room makeover came about when Matt and I were sitting in the room and decided that it is way too dark in the room. We have regular sized windows in the family room so it doesn’t feel like a lower level or basement but, the dark paint color on the walls was making the room feel smaller and dark. After we painted the walls, I knew I had to paint the coffee table. I bought the Ethan Allen coffee table at a yard sale years ago. 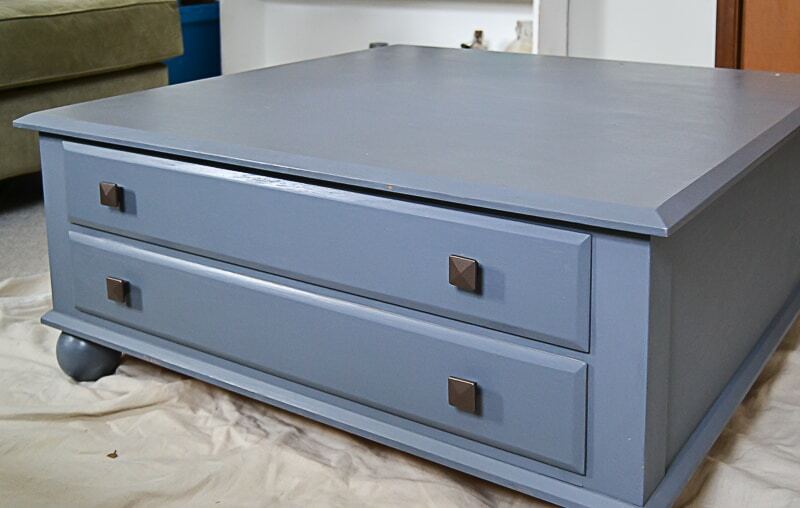 I painted it a blue color, but with this family room makeover, the blue wasn’t going to cut it anymore. 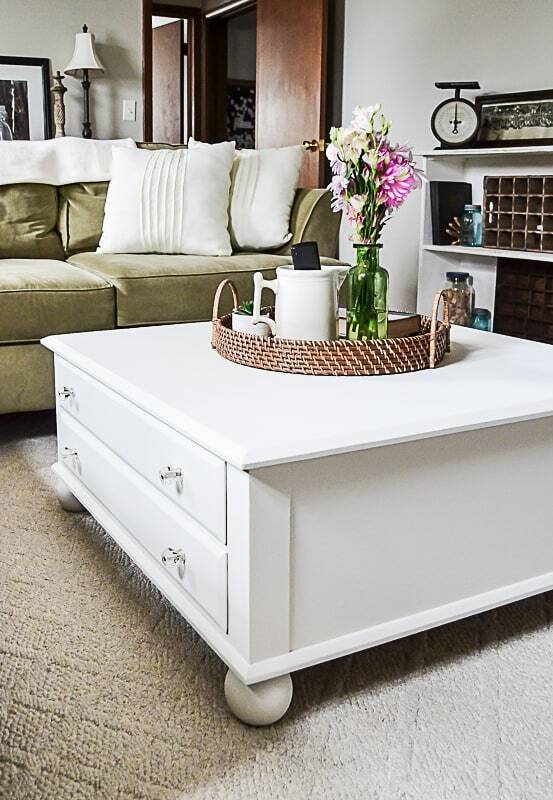 I could have gotten a new coffee table, but this one is so sturdy! It also fits the sectional nice. The kids can sit and stand on this table and I never have to worry about it. It will hold them and their friends. So, I had to get creative on the color. 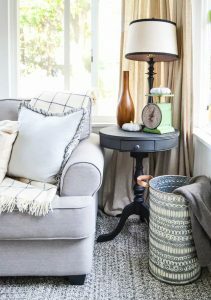 I knew I wanted to lighten the coffee table so I looked through the colors I had on hand and mixed the rest of the “Drop Cloth“ I had with “Fluff“ and “Buttercream“. 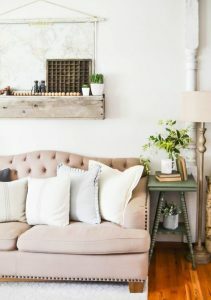 With this mixture, I was able to get a creamy white color that was beautiful on the coffee table. Not only did it lighten the coffee table, but it gave me the look I wanted without having to get rid of the function we need with this table. Money saved and I love the coffee table all over again. 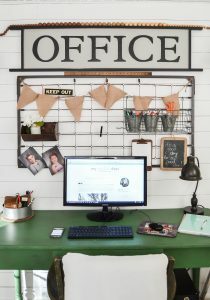 If I have said it before, I will say it a gazillion times over: If you don’t love something in your space, change it! Maybe it’s paint, maybe it’s changing out the hardware. Don’t feel like you are stuck with something you don’t love. Get creative and make it something you love. It doesn’t have to cost a lot of money. 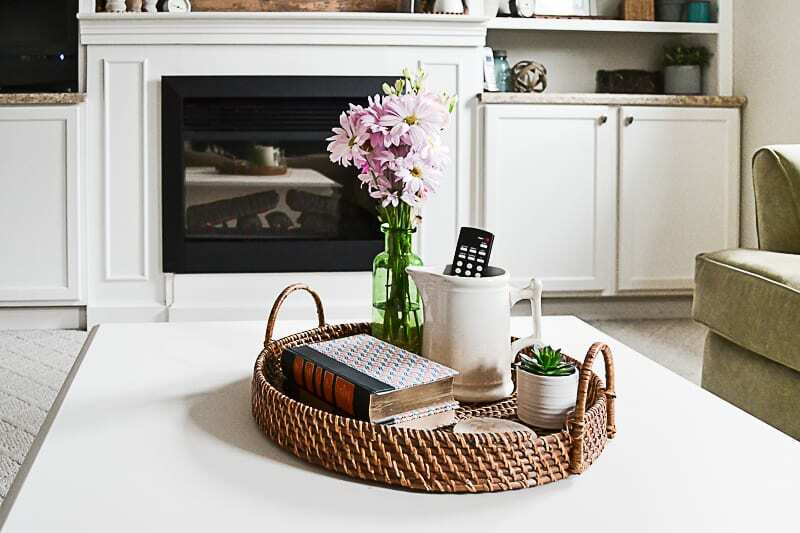 Small changes make the biggest differences in a space. Phew. I went on a tirade there. I had to change out the knobs on this coffee table too. We had a bag of glass knobs in the garage that were the perfect fit. 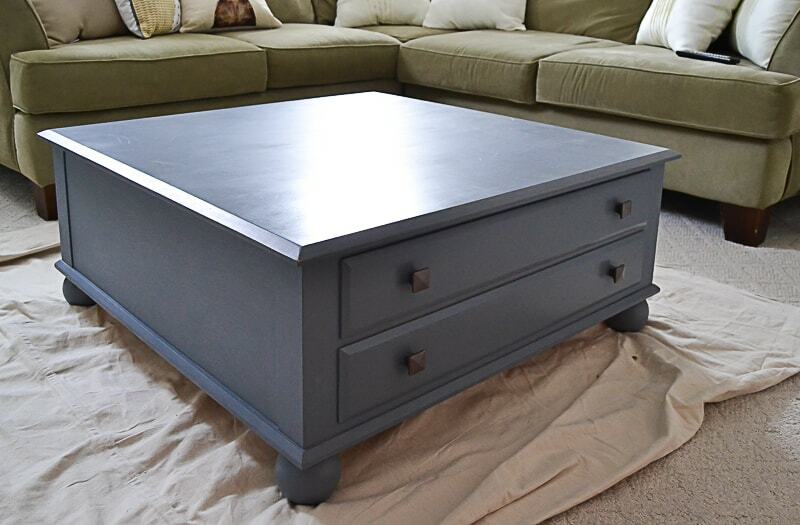 This large coffee table makeover would not have been complete without changing the knobs, that’s for sure. 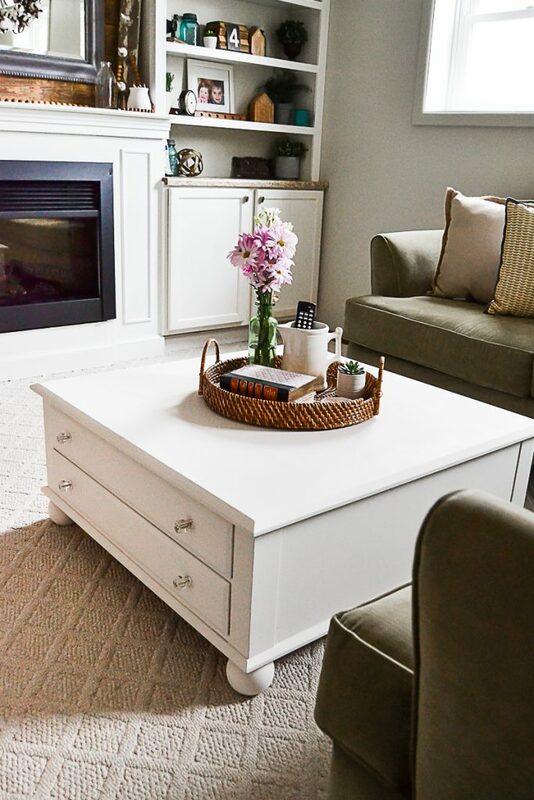 Not only has paint on the walls change the look of our family room, but painting this coffee table was the best decision to getting the look we wanted. I am still waiting on a sign for the wall between the windows to surprise the kids with and I want to find some new things to hang on the other walls, but it is coming together. 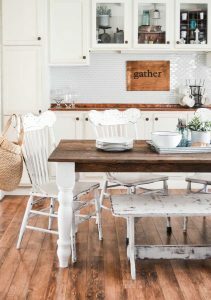 Yard season is coming up soon so I am super excited to see what I can find to add to our family room. 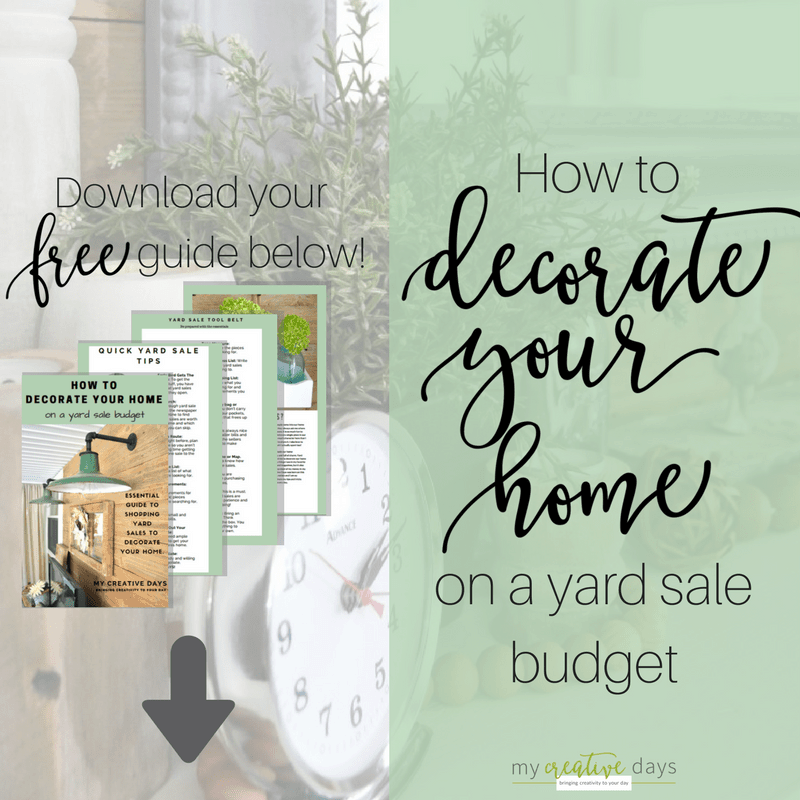 If you love to shop yard sales or want to learn more about how to shop yard sales, I put together a FREE guide with all of my tips and tricks. You can sign up to receive it HERE. 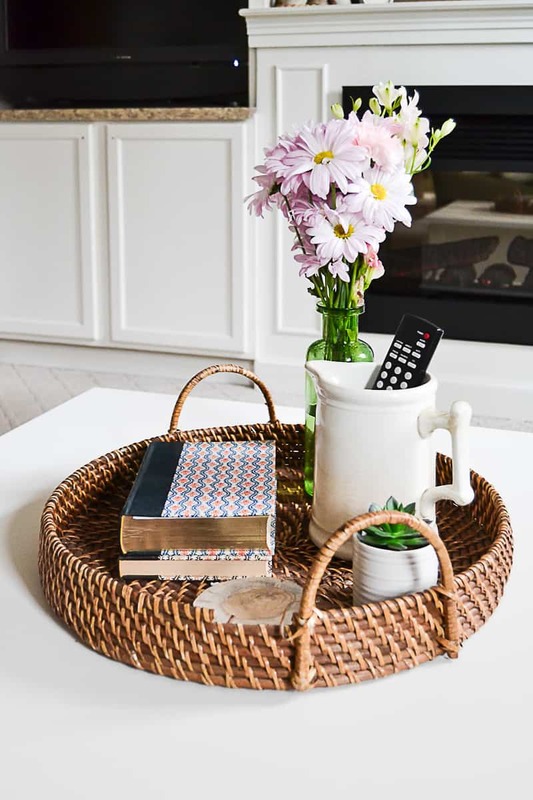 What do you think of the large square coffee table makeover? What color would you have painted it? 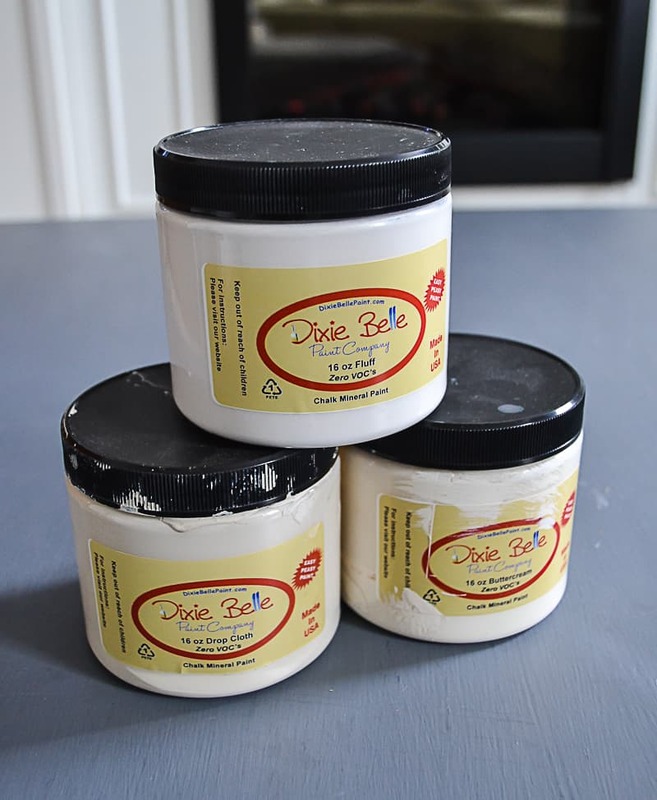 You can see all of Dixie Belle Paint colors HERE. 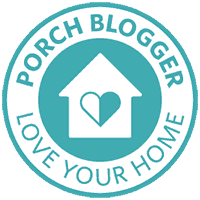 It is so sturdy and will stand the test of time with growing kids so we have to keep it! Love the storage it has too. Thank you! Love how this turned out! So pretty!!! Great job! It looks like a totally different room! It is! Waiting on a few more things to finish it, but excited to share the rest. It is amazing what paint can do. Hi! I love what you did to the square coffee table. I have one too that I’d love to paint but just had a few questions. Did you use a brush or roller to put the paint on? And did you put any type of glaze or finish over the paint? Any help would be much appreciated! Thanks so much! I used a brush, but a roller would be fine too. I did not put a top coat on it yet, but I probably will put a matte top coat on it. Thanks for your question!